Is anyone else kind of in shock that we're heading into September already? How is it almost October? 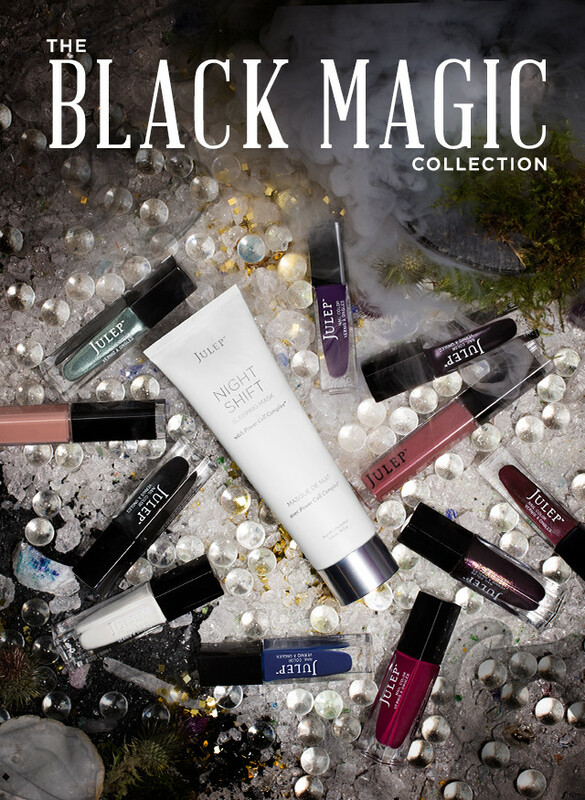 Julep's October window selection will be opening soon and this month's collection is called "The Black Magic Collection". While I'm still a wee bit upset with Julep over the Jewel Heist Mystery Box being anything but jewel like I'm still excited for October's releases and am a sucker for Halloween polishes so I'll use the last of my Julep Jewels to score the entire collection if possible. One of the new items to be released is called Night Shift Sleeping Mask ($34) and it's some sort of "sleeping mask". Selection window opens September 20! Once open I'll update this blog post with more information. Credit to kElizascope on MakeupTalk.com for providing me with the pre-information on The Black Magic Collection! Not a member of Julep yet? You can try it for free! Use the promo code FREECITY. (Note: Applicable taxes and or shipping may apply.) New Mavens: Monthly billing is $24.99 with no skip option but you can cancel at any time. The October Maven Reveal is open now through September 24, 2014! Julep Lip Gloss: A sheer, subtle gloss that makes lips look and feel amazing. Infused with our ultra hydrating, age-defying Power Cell Complex™. Note: Dana is a black light reactive polish it is NOT a glow-in-the-dark polish! Note: Maven Lux is not shown among the selections other than as an add-on. Blank Canvas Mattifying Face Primer: A shine-proof base for smooth, even makeup that lasts all day. Bare Face Cleansing Oil: A lightweight, antioxidant-rich oil blend that cleanses without over-drying. Konjac Sponge: This super-soft sponge is an all-natural exfoliant made from the fibrous root of the Japanese Konjac plant. Bonus: It's attached to a suction cup for easy shower storage. Black Cat Nail Decals: Kitties stick on & look great with or without polish. Meow. Freedom Polymer Top Coat: A high-gloss finish that dries smudge-free in five minutes. Oxygen Performance Top Coat: A breathable, fast-dry top coat with major shine and stamina. White Chevron Nail Decals: Zig zags stick on & look great with or without polish.